Tony had a concerned comment yesterday, that Millie looked quite depressed. I can assure you she is definitely on the mend. Her life in the class room started around six month ago, when my students had the brief to develop a magazine ad series for raw milk. One of the students just couldn’t find an angle into it and so I brought the cow along to illustrate some options. I had found her at the salvation army store the same day. When I came back the next day, the poor little thing was lying neglected on the floor. I just picked her up and hung her in the rafters to symbolise another idea had died. To make sure the message was received, I also stuck a chopstick through her body (and before anybody gets up in arms: It doesn’t go right through. it is attached with blue tack). I do love my job and my students :). 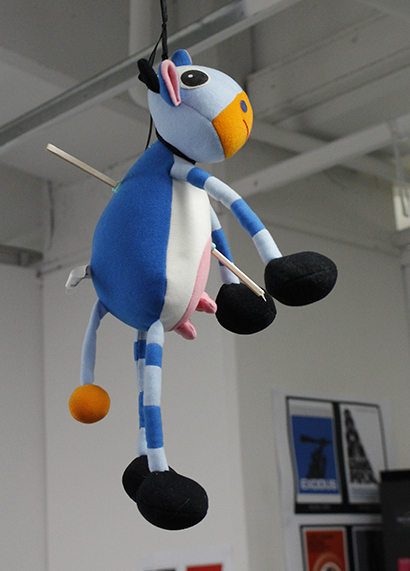 The students of course decided the cow has to live! Phew! And there was I thinking she was a gonner when I saw this picture. Oh no, she is a hardy little thing.